It’s hard to compare the “Green City” of Freiburg, population 220,000 and home to Freiburg Uni (enrollment 23,000), with the small community of Mansfield, Connecticut, home to UConn’s main campus in Storrs, where the town’s population literally doubles when 22,000 students return in late-August for the start of the academic year. 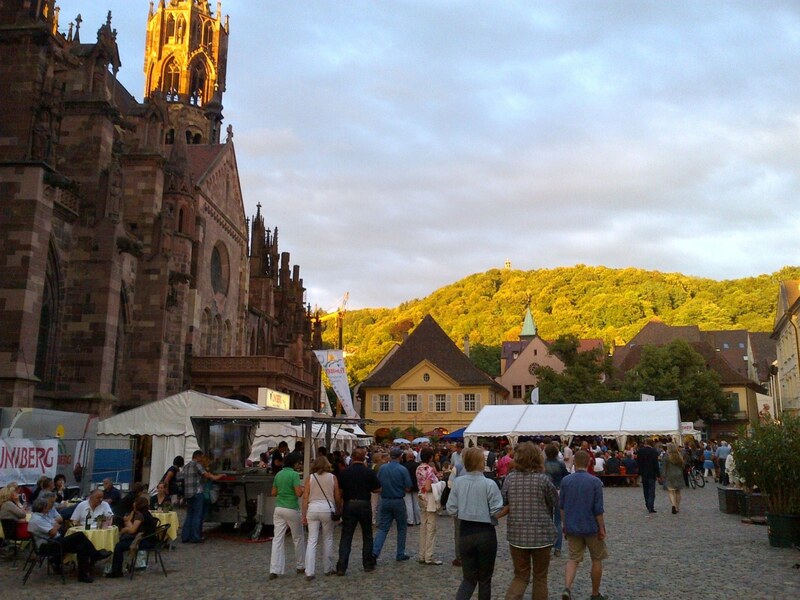 In fact, it would be difficult comparing any town or city to Freiburg, with its unique blend of historical charm, natural surroundings, ecotourism and green technology cluster. After my self-styled “International Sustainability Exchange,” which, thanks to a professional staff travel grant from UConn’s Office of Global Programs, consisted of two weeks of: (i) meetings and interviews with university and city officials, (ii) a guest lecture and conversations with graduate students studying Renewable Energy Management, and (iii) guided and self-guided tours of the campus, city and surrounding sights, I left Germany reassured that UConn deserves its lofty #5 position in the Sierra Club’s 2012 rankings of America’s greenest colleges, yet inspired by Freiburg to envision how we can do even more to improve campus sustainability. 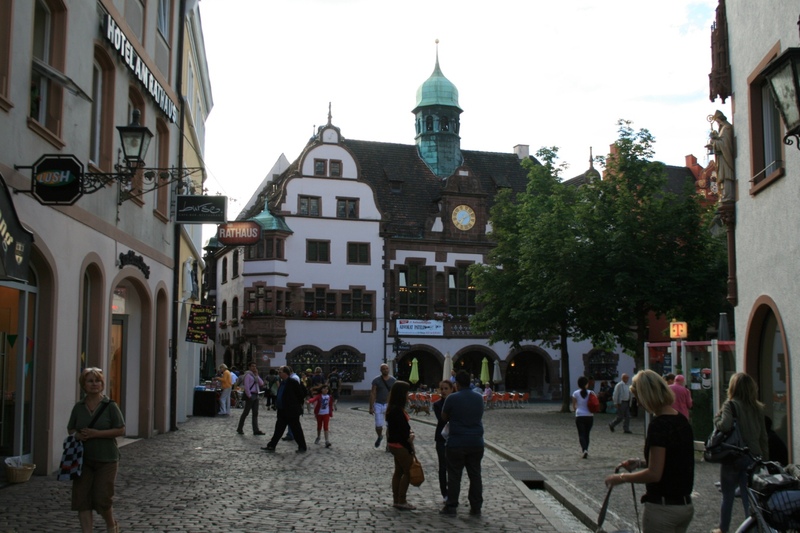 The Freiburg town hall (center), where I met with local officials, including the mayor’s environmental director, and found “Green City” tours and information. Beyond Freiburg’s strengths in renewable energy, mass transit and bicycle friendliness, (see Parts 1-4 of this blog), here are some takeaways based on my sustainability exchange experience. UConn can do more to promote its natural assets. The 440-acre Fenton tract of the UConn Forest, adjacent to the Agricultural/East Campus is certainly not as vast and scenic as the iconic Black Forest, which overlooks Freiburg and the University’s campus, but there is plenty of natural diversity for UConn students and local hikers to experience there. About eight years ago, student environmental organizations, led by EcoHusky and the Soil and Water Conservation Society, installed trail head signs on the East Campus, marking access points to Fenton forest hiking trails. Still, when I ask for a show of hands during one of my guest lectures, I’m always amazed that most third- and fourth-year students, even in environmental majors, have never been on the blue-blazed Nipmuck trail along the Fenton River, or walked through the Fenton tract to see the remnants of the University’s long-abandoned Horsebarn Hill ski lift, or its special forest areas featuring stands of old growth trees and the Oguschwitz Meadow. Similarly, there’s not widespread appreciation among students, faculty or staff for the North Campus’s 64-acre Hillside Environmental Education Park, with its 2 miles of hiking trails, including boardwalks and observations decks over restored wetlands. In contrast, from anywhere in Freiburg, there are constant reminders that the Black Forest or “Schwarzvald,” is nearby – it’s a centerpiece of Freiburg’s vibrant ecotourism business and self-described identity. Freiburg has also created rest stops and embellished attractions that draw people of all ages up the hillside trails and into the forest, like benches, picnic areas, playgrounds, public art displays, historic monuments, an observation tower and, of course, a beer garden (this is Germany after all) overlooking the city. A popular hillside restaurant and beer garden helped attract people onto the Black Forest trails. 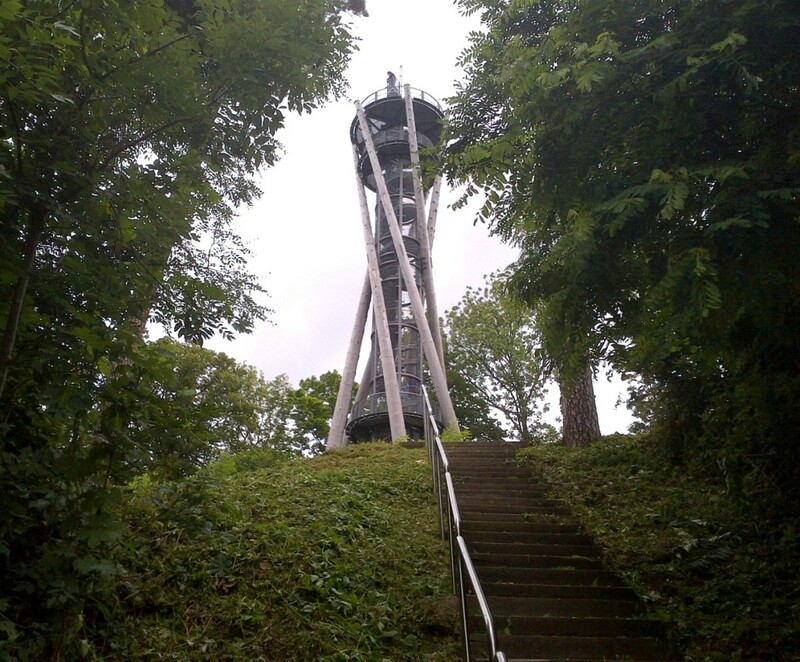 It was a short hike into the Black Forest to this observation tower, which was built as a civic project with financial support from company and individual donors. 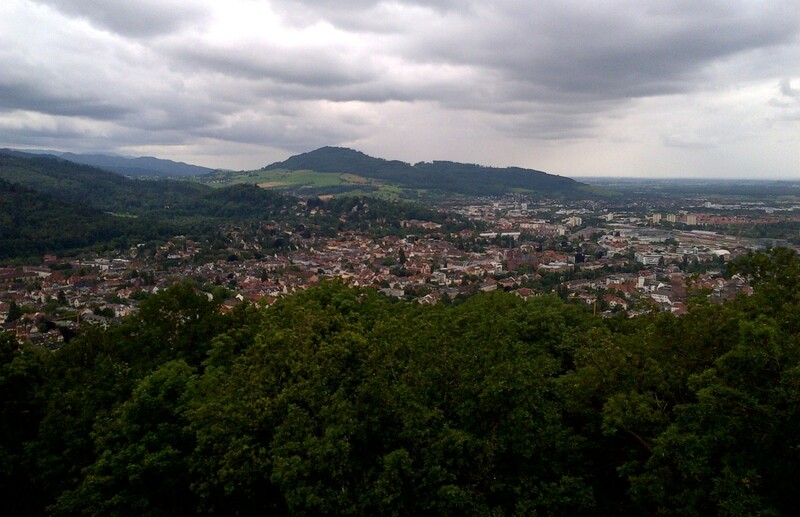 Below is the view of Freiburg from near the top of the tower. On a clear day, the Swiss Alps would be visible from this vantage point. It was also remarkable to be able to reach Freiburg’s many parks and natural attractions on foot or by bicycle, along well-marked bike paths. Leaving from the city’s centralized “Mobile” bike station, I pedaled for 30-40 minutes along the Dreisam River trail to reach Freiburg’s Seepark, a beautiful public lake, surrounded by open space and playing fields. It was a nice day and there were pockets of people, their bikes nearby, swimming or sunbathing on the grassy lakeside, but no parking lots for motor vehicles anywhere in sight. I biked on the trail that looped around the lake and stopped for lunch, a tasty Weisswurst, at the waterfront beer garden (this is Germany after all). 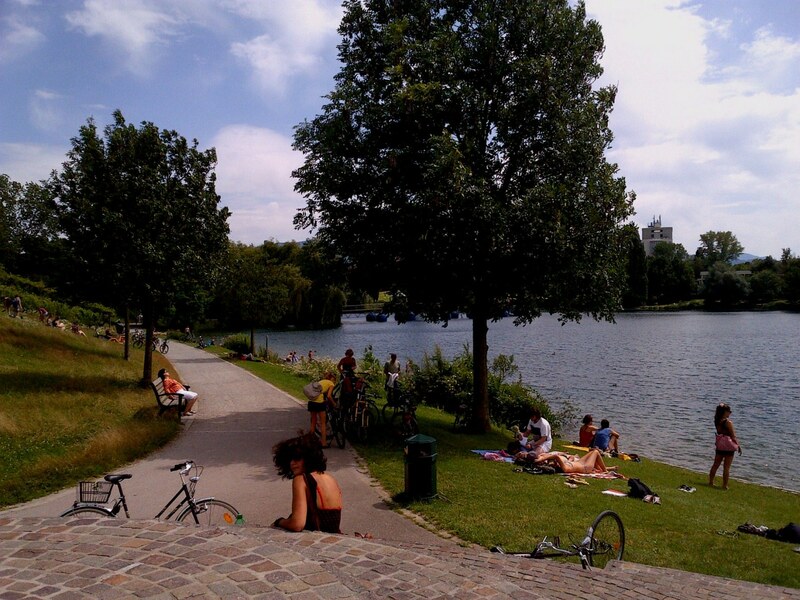 The lake at Seepark was easily accessible by bike from the inner city and Freiburg Uni’s campus. I thought about a comparably-sized swimming hole near UConn’s main campus in Storrs, the Mansfield Hollow reservoir and picnic area. It’s probably about the same distance from Storrs as Seepark is from Freiburg’s inner-city, but getting to Mansfield Hollow by bike on the most direct path from the main campus would be along Route 195. With posted speed limits of 45 MPH in sections, no designated bike lanes and often narrow shoulders, Route 195 is the main drag into and out of UConn’s campus and one of the busiest state roads in Connecticut. In other words, Mansfield Hollow is not as easily connected to the campus or well-used by most UConn students. Recycling made easy. UConn is now a single-stream campus (with a large inventory of dual-stream bins purchased just five years ago), while Freiburg Uni is decidedly multiple-stream. At UConn, students can use any recycling bin for any recyclable item. The green outdoor single stream bins are plentiful throughout the core campus and usually coupled with black trash containers, so that recycling is as convenient as trash disposal. At Freiburg, there were separate bins for separate colored glass bottles: green, brown, yellow or clear, alongside separate bins for different types of paper, and separate bins for aluminum cans, and separate bins for plastic bottles. Sometime these multiple-stream recycling bins were coupled with trash cans, but often they were not. While both universities receive a small financial incentive from their haulers for delivering clean streams of recyclables, UConn’s contractor separates items at its transfer station, which makes recycling more user-friendly and efficient on campus. Also, as a land grant university, with agricultural roots, we also compost nearly 5,000 tons of organic waste a year at our state-of-the-art facility, constructed in 2010. Sustainable stormwater management. Not too long ago, at the start of UConn 2000, a $2.3 billion state bond-funded capital improvement program that has successfully transformed the University’s campuses, we had our share of problems managing stormwater, particularly from construction sites. UConn has responded over the past 10 years by becoming a national leader in on-campus low impact design (LID) features, such as rain gardens, bio-retention swales, permeable asphalt parking lots, porous paver snow shelves and terraces, and green roofs. By infiltrating rainwater, LID features maintain a site’s natural hydrology and ease the volume and velocity of runoff into conventional storm drainage systems, which can cause downstream erosion and carry sediment and pollution directly into rivers, lakes and ponds. All of our on-campus LID features are part of the landscape and designed to be seen by thousands of students every day – some have signs describing their environmental benefits. I was told by a reliable source that Freiburg Uni has several green roofs, but none of them appear to be easily visible or accessible to students. I photographed one green roof which was shown to me from the third floor of an administrative office building. 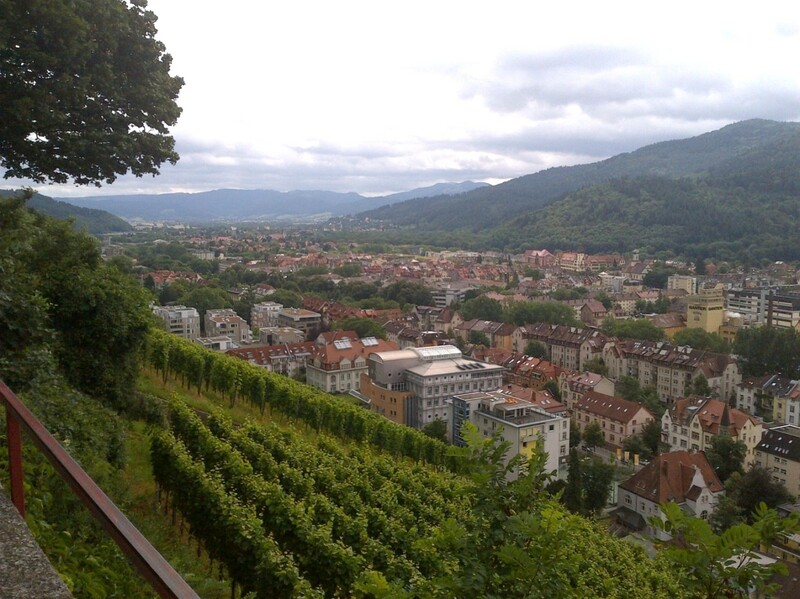 The city of Freiburg has plenty of impervious cover (IC), which usually correlates to water quality problems. However, I’m not sure that’s the case here. Although IC is the antithesis of LID, one can hardly argue with the intricately inlaid brick and cobblestone walkways, roads and plazas that are integral to the historic charm of Freiburg’s Old City or “Altstadt.” Then there’s the bächle – a system of narrow canals continuously flowing throughout the Altstadt with some combination of stormwater, surface water and ground water along those brick and stone roads and walkways, then between, under and through courtyards and buildings. 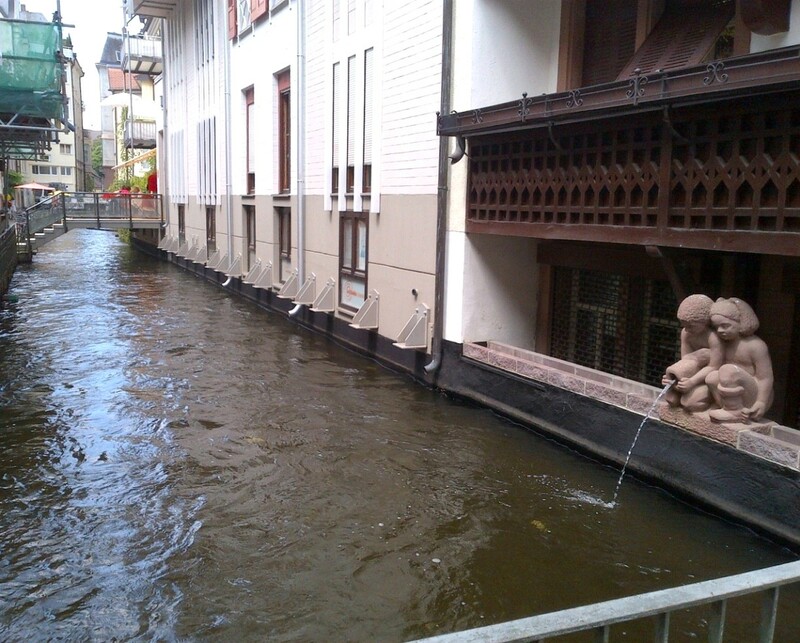 The bächle also help cool the surrounding buildings and neighborhoods. Were these canals part of the same geothermal system that cools half of the Freiburg Uni campus? Although I’m sure they once also served as the city’s sanitary sewer, I was told there is no longer any sewage discharging into the canal system. In fact, the water looked clean. Parents let their kids play in the canals and pet owners let their dogs drink from them. I wish I had learned more about how the bächle worked. Is it a complex system to operate and maintain year-round and what is its role and relative effectiveness in managing stormwater and improving water quality? I’d be curious to know what sorts of things have been lost and found in the bowels of the system. I accidentally fumbled a map into a rapidly-flowing bächle and it quickly floated down the canal, dropping and out-of- sight into a catch basin before I could retrieve it. 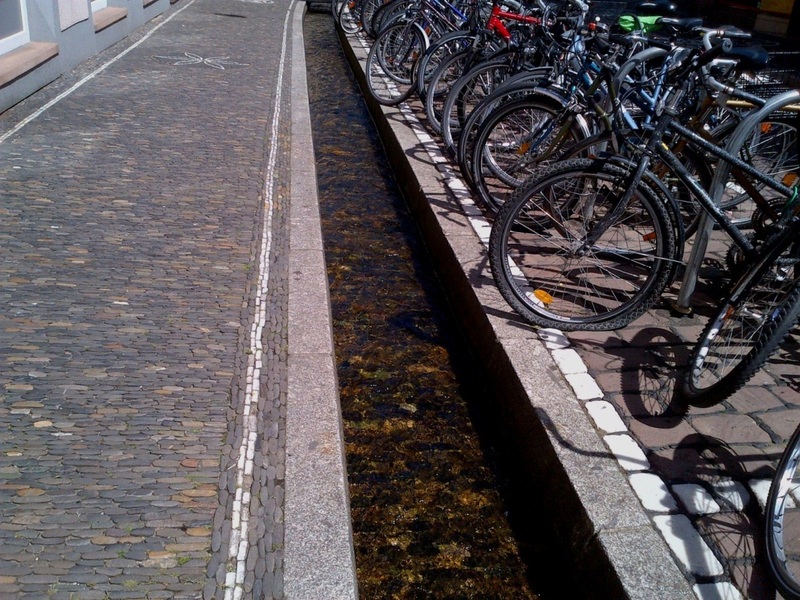 The bächle (above and below) is a narrow canal system that collects stormwater and flows throughout Freiburg’s Altstadt and portions of the University’s campus. Landscaping and gardens. 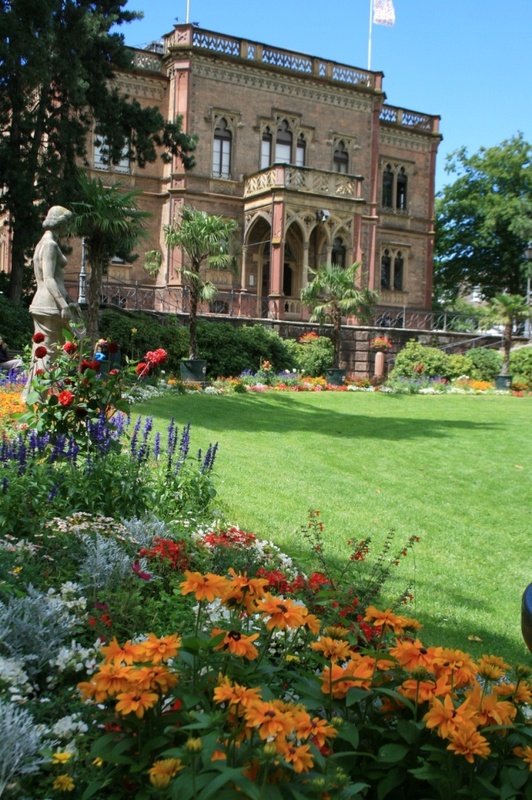 Freiburg, including the University’s campus, has several meticulously-maintained gardens, featuring manicured lawns and colorful flower beds around courtyards with statuary and fountains. 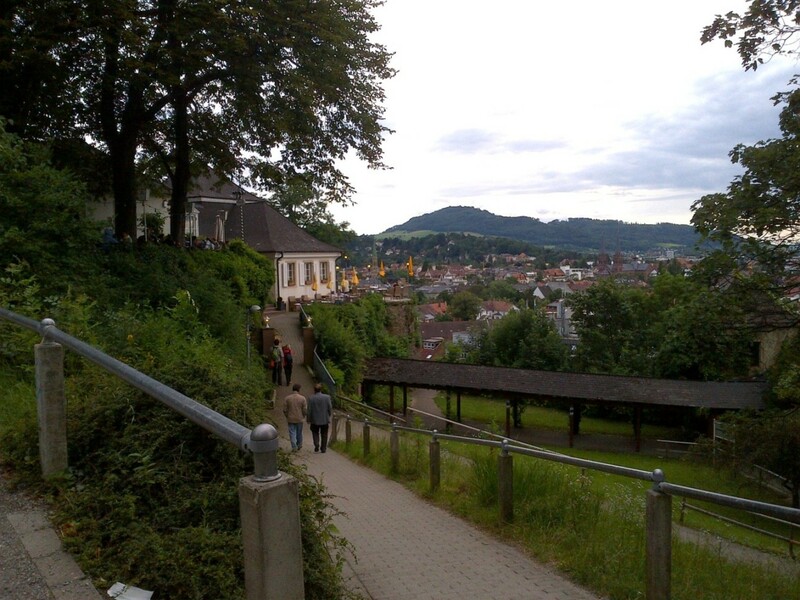 In stark contrast, the landscape in other parts of Freiburg’s campus and city side streets was poorly maintained. Patches of lawn around many buildings had given way to tall weeds that looked untouched by a mower all summer. There were potholes, fallen debris and overgrown hedges along the sidewalks. I’m not sure if this was a concession to budget cuts or a more natural approach to landscaping, or a little of both. Flower gardens at the Anthropology Museum in Freiburg. Well-maintained, traditional landscaping at the entrance to the hospital on the Freiburg Uni medical school campus. Friends of mine who are organic gardeners have eliminated or minimized lawn area in their yards. They add wildflower seeds to a meadow mix and extol the virtues of clover. By late-summer they end up with a lot of crabgrass but they’re content because they haven’t used herbicides or synthetic fertilizers. That kind of approach to landscape maintenance is a tough sell on college campuses. UConn employs integrated pest management techniques on its lawns and landscaped gardens, and our newest classroom building features xeriscaping, bio-retention swales, a green roof and even edible plants, like blueberry bushes. Like other campuses in colder climates, winter takes its toll on our landscaping and a dry summer can turn our lawns brown in a few weeks, especially since we conserve potable water by limiting landscape irrigation to new plants, gardens or turf. We’ll complete construction soon of a new centrally-located academic building, which includes a large underground cistern that will be used to collect rainwater for irrigating the lawn and gardens around one of our busier outdoor common areas, the Student Union quad. Farm-to-Table. Freiburgers value locally-grown food, locally-brewed beer and local wines from area vineyards. Signs in an inner-city grocery store identified local dairy products and produce, which were fresh, relatively inexpensive and very good. 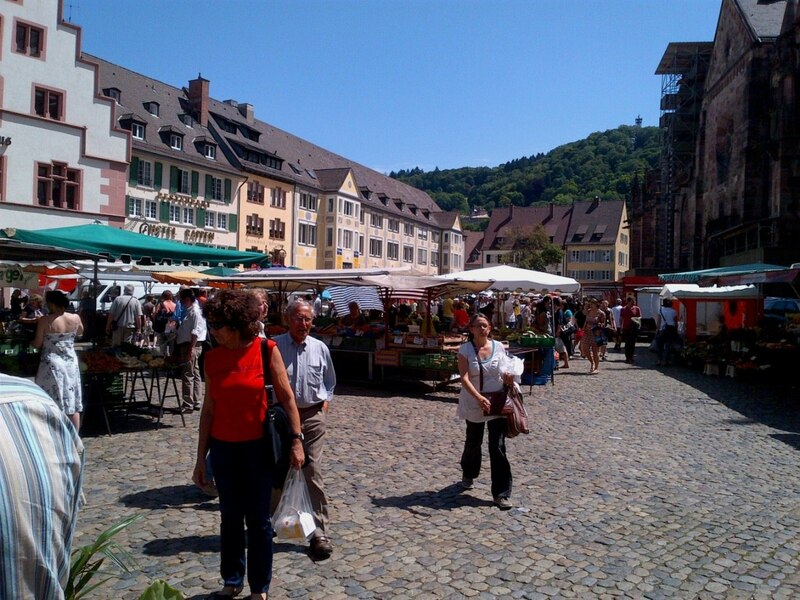 Every morning in the Altstadt’s central plaza, the Munsterplatz, a farmers’ market bustled under a dozen or so tents. On my bike ride to Seepark, I came across acres of community gardens divided by fences into small rectangular plots, some with elaborate sheds or makeshift greenhouses, and all very successfully growing everything from flowers, to herbs and vegetables. 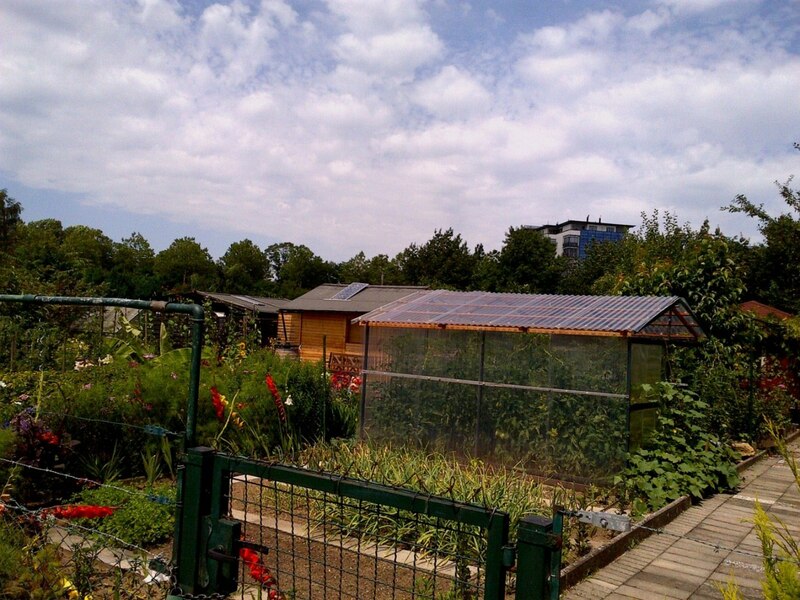 A small section of the lush community garden plots on found my way to Seepark – there were micro-scale wind turbines on the roof of the building in the background. Part of the local Farmers’ Market held every morning in the Munsterplatz. Below, an evening festival held in the same plaza featured local wineries and breweries. UConn has also embraced locally-grown food, which is sourced and promoted through Dining Services’ Local Routes program. Whitney is the original sustainable dining hall at UConn, and has specialized in, among other things, locally grown, organic, veghan, vegetarian, fair trade, free range and rainforest alliance items. Small placards in Whitney tell diners where their food came from, like the honey from UConn’s apiary or veggies from the 1.4 –acre Spring Valley Farm, cultivated by students living in two off-campus farmhouses that are part of UConn’s EcoHouse living and learning community. In the final analysis, it’s fair to say that I found more similarities than differences between Freiburg Uni and UConn, the two sister universities that partner for study abroad and other global exchange programs. 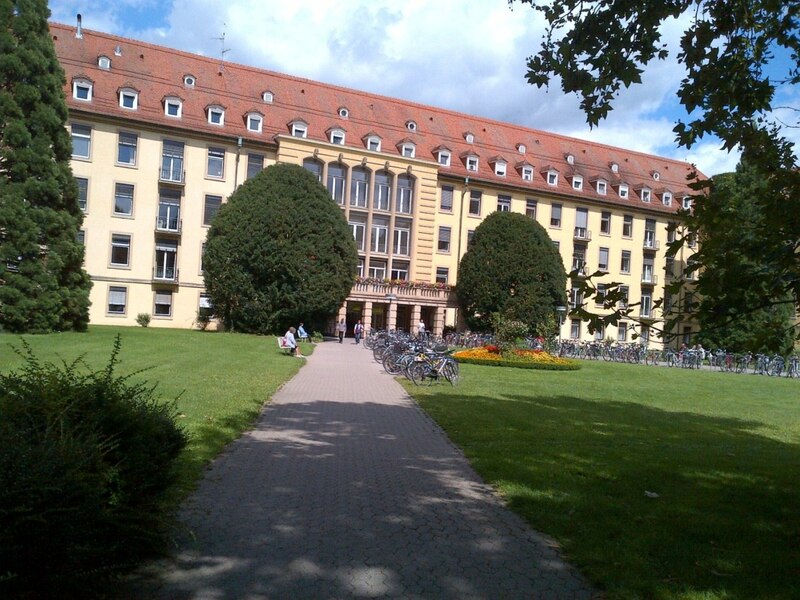 Freiburg Uni benefits from being part of the greenest city in Germany. The investment the city has made in sustainable mass transit alone is mind-boggling and the University community, like any other resident or visitor is, quite literally, “along for the ride.” Even though residents and officials in UConn’s hometown of Mansfield may be just as environmentally-minded and visionary as their Freiburg counterparts, they have small town resources and tend to rely on, and partner with, UConn for things like utility services for town, commercial and residential buildings in and around Storrs. Consequently, UConn’s sustainability record has benefited from having to be more self-sufficient in managing its property and developing these kinds of basic programs and services for the University community. With the ownership, maintenance and operation of 4,000 acres of land, a variety of research farms, a public transit system, a water supply system, a 25 MW cogeneration facility and a sewage treatment plant, along with miles of underground and above ground distribution infrastructure, comes the ability for UConn to shape its own destiny and the opportunity (some would say obligation) to develop more holistic, integrated approaches to sustainability. Vielen danke Freiburg for the ideas and inspiration! 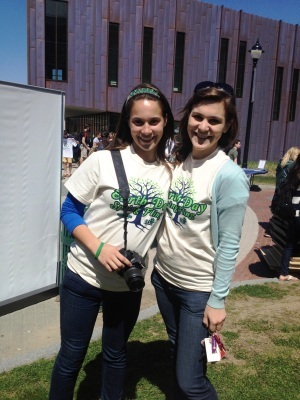 My name is Emily and I am a UConn freshman majoring in Natural Resources with a concentration in water and climate. My interest in the protection of our ecosystem is ethically, scientifically, and emotionally rooted. My dad is a geologist who has worked in the environmental field for the last 25 years. He began his career cleaning highly contaminated superfund sites and now manages a large portfolio of real estate. He is responsible for ensuring that the land and buildings he covers are compliant with federal and state environmental regulations. He works hard to preserve the environment and educate others on the importance of sustainable business practices. My dad’s belief in his work is seamlessly integrated into everything he does from family dinner conversations about rising ocean levels to detailed explanations of the latest fossil find. His enthusiasm and passion for his work and our natural surroundings is infectious. I’ve known for several years now that I want to follow in my dad’s footsteps and dedicate myself to environmental studies. When I started to apply for college my senior year of high school, UConn was not very high on my list. I knew it was regarded as an excellent public university but I had always pictured myself at a small school deep in the mountains. To be honest, when I ultimately decided to go to UConn, I was disappointed and this feeling of discouragement didn’t subside for quite some time. It was recommended that I take an INTD course with Rich Miller, the director of the Office of Environmental Policy (OEP). The class would be a one-credit course that focused on UConn’s sustainability initiatives. The first few weeks concentrated on student introductions and familiarization of the campus layout. Within the first month, however, we started to discuss the University’s outlook and goals on sustainability. We went over UConn’s recycling, composting, education outreach, transportation, energy, and much more. 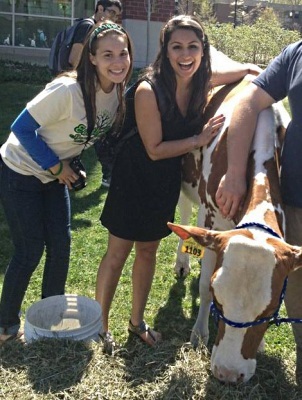 I was very surprised at the diverse range of sustainable activities UConn had committed itself to. Over the course of the semester, I learned a great deal about the University’s efforts and I must confess I was very impressed. My spring semester of freshman year I was lucky enough to receive an internship at the Office of Environmental Policy and this has served to further expand my knowledge on UConn’s devotion to environmental conservation. I attended several important meetings including one for EPAC (Environmental Policy Advisory Council) and a Recycling Workgroup. It was exciting to finally be introduced to others who shared my love for the environment. Unfortunately, I have noticed that there is fallout when it comes to the general student body’s understanding and recognition of the OEP’s work. For instance, UConn has single stream recycling but very few know what this is and even those who do are unaware that it is used on our campus. I am very proud of what UConn has done to support sustainability and I only wish more would feel this same way. Now that my freshman year has come to an end and I have had time to think back on all of my experiences, I must say that I am very happy with my choice to come to UConn. The tremendous size once intimidated me but now I see this only gives me a larger audience to influence. I feel very privileged to have the opportunity to help our University take a leadership role in sustainability and I want nothing more than to help educate my peers on the importance of protecting our environment and bring recognition to all that the OEP and UConn has done thus far. In my two years as a Sustainability Intern with the Office of Environmental Policy, I have been placed in a very interesting role. I have compiled the three greenhouse gas emission inventories for the Storrs campus from 2009 up though last year, 2011. This task has proven to be something I can look back on and be proud of and something that I think the University can also look back on and be proud of. The greenhouse gas inventory documents all the sources of emissions from the University that contribute to global warming, such as carbon dioxide, methane, nitrous oxide, and many others. The University has voluntarily tracking this information to some degree since 2003 although thorough inventories did not begin until 2007. In 2008, then President Michael Hogan made the University a signatory of the American College and University Presidents’ Climate Commitment (PCC) at the request of large student support. The PCC is a pledge by institutions of higher education to reach a goal of climate neutrality by the year 2050. Signatories must have submitted an outline of how they would reduce their emissions to the 2050 target in a document known as a Climate Action Plan in order to become a part of the PCC. Additionally, participating institutions must provide annual greenhouse gas inventories and biannual progress updates. In general our largest source of emissions each year has been from on campus stationary sources such as the cogeneration plant (which supplies most of the Storrs campus with electricity and steam), boilers (to produce additional steam for heating), chillers (which produce chilled water for cooling buildings), and generators (for emergency power). In fact, going back to 2001, this source of emissions has never accounted for less than 75% of the total campus emissions. In 2010, 77% of emissions come from either fuel burnt at the cogeneration plant or from stationary sources like generators and chillers. This indicates that decreasing the demand for electricty, steam, and chilled water on campus is worthwhile strategy for reducing the amount of emissions generated each year. The University of Connecticut has gone to great lengths to make its buildings significantly more energy efficient over the last few years. Some of the energy-saving initiatives have included replacement of lighting fixtures and bulbs, the annual EcoMadness energy conservation competition, and the sustainable design and construction guidelines. The line shows a three year moving average. Emissions are measured in metric tons of carbon dioxide equivalent. For reference, the average passenger car produces 5 MT eCO2 per year. The above graph shows that over time UConn has been able to produce less greenhouse gas emissions on a per student basis over the years. This is especially amazing considering that the student population at UConn has grown by nearly 40% over that time and campus building space has grown by just over 30%. One key to this success has included the construction of the cogeneration system in the central utility plant, which provides UConn with electricity and steam in a more efficient manner than the grid can. Another has been the University’s policy requiring major construction and renovation projects since 2008 to meet a minimum LEED Silver rating, such as the Burton-Schenkman football training complex. The University also has small emission contributions from other categories like transportation, fertilizer application, and refrigerants (which are actually incredibly potent greenhouse gases). Some of the emissions are offset by the UConn forest and its new composting operation. A line has been fitted over the past four years' data to approximate the trend in how UConn's emissions have been going. Form 2007 to 2010, the overall emissions dropped by about 6,000 MT eCO2 per year, which is the equivalent of taking about 120 passenger cars off the road each of those years. This is a 3% annual decline. This is a promising trend considering the fact that the number of full-time students increased 6% over those three years, part-time students by 10%, and summer students by 68%. Although there was a significant drop in building space from 2007 to 2008, building space increased from 2008 to 2010 increased by 3.5%. Working on the greenhouse gas inventory has been immensely rewarding. I personally worked on the greenhouse gas inventories as far back as 2008 and I was the primary intern who worked on the 2009-2011 inventories. Not only am I proud to see my work produce these useful metrics for evaluating our steps towards sustainability, but I am also proud to have been a part of something that connects so much of the University together. For each inventory I had to contact tens of people for information on a huge variety of sources. I received data from sources involved in generating power on campus as well as sources involved in generating compost (which now includes the agricultural compost facility, the floriculture program, many of the campus dining halls, the Spring Valley Farm living and learning community, and the EcoGarden student group). There is just something incredibly exciting to take bits and pieces from so many staff and faculty members and then have the opportunity to show them how their contribution to campus sustainability fits in at our annual spring Environmental Policy Advisory Council (EPAC) meeting. I am excited that in less than one month I can honestly tell them that our University has reduced its emissions by 9% in three years, even as campus and the student body grew. And most exciting is that the 2011 inventory is nearing completion and it is so far promising our largest reduction to date. So ultimately I would remind everyone, as an outgoing intern and as a graduating senior, that you must not let good be the enemy of perfection; take time to appreciate your progress every so often. But likewise, do not rest on your laurels, especially when you have shown in the past just how much you can accomplish. Chris Berthiaume is a senior in Environmental Engineering and a second year intern with the OEP. His major projects have included the greenhouse gas inventory, updating the website, social media engagement, and the assisting with the 2012 EocHusky 5k. Well a week later, after going to get help retouching my resume and worrying about how to write a proper cover letter, I had my interview. I was nervous, but I just remembered to speak honestly and answer every question as fully as I could. It must have worked because I got the job! Not long after my excitement faded, and I started to get nervous about this new hurdle I was about to leap over. I’d never had an office job before, I’d never even had a job before that required more than basic tasks. I was concerned that the additional work would overwhelm me and that it would be a struggle to focus on my studies. I’m not going to lie, I have struggled with some of these things, it isn’t always roses and sunshine, but what I’ve learned is this; anything worth having is worth working for and this experience has helped me grow in so many ways that I feel grateful to have been given this opportunity. Getting an internship early was a great decision. Most people don’t even try to get one until they are juniors or seniors which is fine in several cases, but it’s always good to get ahead of the curve. Now I don’t feel like I’m floundering trying to find something to boost my resume before I pursue a full on career. I also have gained valuable experience in seemingly small tasks like improving my computer skills, learning to better coordinate with people I don’t know, office etiquette and more. Overall my message is this; if you get the chance, definitely take on an internship even if you are only a freshman or sophomore. You never know what good things can come of it and even if it doesn’t work out you still had the experience and maybe crossed something off your list for future career paths. So good luck, and go get ‘em!